People love to eat, and Koreans take every opportunity to enjoy their food. Beaches and mountain valleys are often bustling with food stalls that sometimes prompt visitors to complain that vendors disrupt the vistas. Nevertheless, people line up in front of the shacks to get ice-creams, coffees, hot dogs, waffles and whatever else looks worth a try. In this country of decadent desire for food satisfaction after a decades-long battle with hunger following the Korean War and the New Village Movement of the 1970s, a fad is emerging. Foodies, restaurants, manufacturers and farms are now hooked on salmon, which tastes good raw or cooked. People worldwide have been enjoying salmon for centuries. In Korea, where fads come and go at the speed of light, the craze ― mostly for sushi, sashimi and rolls ― surprisingly is lasting and expanding to broader markets. The craze is not because Koreans have never tasted salmon ― Norwegian salmon has been around since the early 2000s ― it is because of the increasing availability of high-quality, affordable salmon at several local shops. Emart, one of Korea's biggest supermarket franchises, used to sell salmon sushi by the piece ― from 500 won (44 cents) to 800 won each, plastic wrapped. The sushi was an affordable item, cheaply made using frozen salmon fillets. It was the chain's "core" item that drew consumers and accounted for over 35 percent of all sushi products sold. But in 2015, Emart made a risky decision gradually to replace it with the "premium salmon sushi pack," a lunchbox priced at over 10,000 won and containing 10 pieces that used unfrozen, oily, fresh-looking salmon fillets. It hit the jackpot, meeting skyrocketing demand. 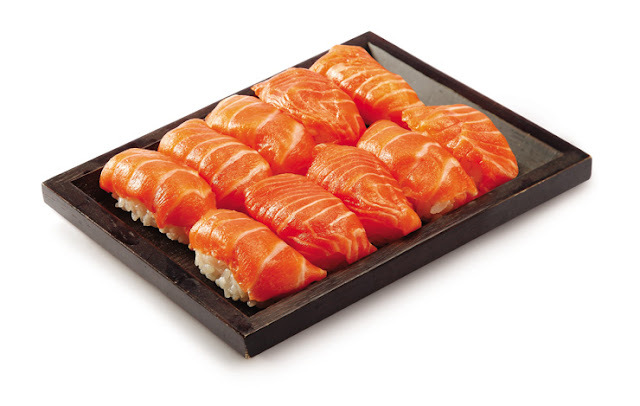 Salmon sushi sales last year increased 43 percent year-on-year, from 7.1 billion won to 10.2 billion won. The packs contributed to raising Emart's overall sushi sales by 24 percent in the period. Bloggers spread the word with photos of the premium pack, saying it is "one of the must-buy items when visiting Emart." Emart's Kim Young-pil, who came up with the premium pack idea, says he cannot fool Korea's increasing number of sushi lovers "who can tell which is good salmon sushi only by color," according to online news outlet MK. "We used to focus on a cheap price and large quantity but now the foremost element is quality," Kim said. "The product then sells itself, with consumers spreading the word." Another popular hotspot for salmon lovers in Korea is U.S. retailer Costco. Online foodies say it offers "unbeatable cost-effectiveness" for buyers of the fish. The warehouse sells salmon far cheaper than restaurants and has attracted people looking for chunks weighing over several kilos to serve at large gatherings. The Instagram posts of some foodies have promoted Costco with photos showing what they had done with salmon bought there. Korean food maker Sempio's sub-brand Ziller has twisted the traditional Western idea of beef jerky by creating "salmon jerky" last June. The marinated dried salmon purportedly "blows away one's stress with a signature spicy flavor concocted with Koreans' favorite mouth-on-fire ingredients like garlic, ginger and cheongyang red pepper," according to the maker. From 2010 to 2015, Korea's salmon consumption nearly tripled ― from 12,000 to 34,000 tons ― according to Chosun Biz. Salmon sales at Emart from January to October last year (14.7 billion won) beat halibut (13 billion won), which had long been the most popular fish for sashimi in Korea. Salmon's appeal to a wider range of consumers, including young adults who flock to the increasing number of eateries dedicated to offering "unlimited" salmon, contributed to stoking the nationwide boom. Salmon started to be imported from Norway in the early 2000s. But a game-changing moment came when Korea successfully farmed 500 tons of salmon in waters off Goseong-gun in Gangwon Province and released the fish to markets last November. It is ushering in the "salmon renaissance," in which domestic fish are replacing European imports, cutting distribution costs. The salmon farming, a breakthrough for Asia, including Japan, was thanks to Korean fish farmer Donghae STF, which used cages that moved up and down to keep the fish in water below 20 degrees Celsius. Donghae first imported salmon eggs from Canada in 2014 and, after they hatched, began to farm the fish the next year. They grew to five kilograms in 20 months, similar to the Norwegian imports' size. Easier distribution has saved money and helped reach more domestic tables: Korean salmon is 10 percent cheaper than imported salmon's cost of 13,000 won per kilogram. Distribution to anywhere in Korea takes no longer than a day, promising freshness. "Some Koreans evaluated that Korean salmon tastes better than Norwegian salmon," online news outlet eDaily said, citing Hyewon FnC, which started selling domestic salmon online this month. 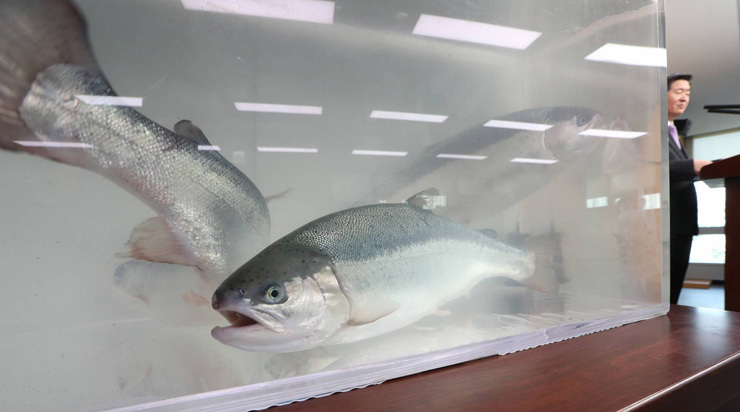 "More Koreans have high expectations for domestic salmon over the imported fish. Given the farming continues, we could even export them."